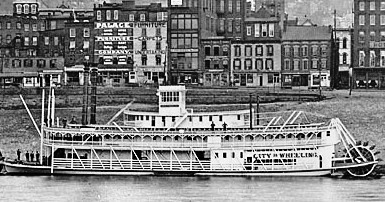 Wheeling began building boats, Barges, Bateaux, Flatboats, Keelboats, and Pirogues in 1774, the first Ohio River city to build boats, and the third settlement on the ‘Western Rivers’ to have a boat building industry. ‘Western Rivers’ are rivers that flow into the Gulf of Mexico. Red Stone Old Fort now Brownsville, Pennsylvania was building boats for the Army in the 1750s. Pittsburgh was building boats for the Army in the 1760s; both were on the Monongahela River. Listed in alphabetical order are the 225 Steamboats built at Wheeling. Wheeling, Virginia built the first successful steamboat, the Washington in 1815. In 1769, Wheeling was born a town in the State of Virginia. June 20, 1863, Wheeling became a town in the State of West Virginia, the 35th state admitted to the union. In 1900, the City of Wheeling was the last steamboat completed at Wheeling, seen here September 2nd 1900 at Wheeling, West Virginia. Wheeling boat yards built complete steamboats. Steamboat hulls were built in Wheeling and the steamboat’s cabins were completed elsewhere. By the 1850s with heavy timber becoming scarce near Wheeling, boat builders would have many of their hulls built elsewhere, and then have them towed to Wheeling for the machinery, cabin carpentry and furnishings. In addition, with the B&O’s arrival, crossties needed for the railroads used up most of the hardwoods left. Machinery, (engines, boilers) were manufactured here, but with little account of which works built them. Phillips manufactured machinery for steamboats. Phillips, attributed with building boats, had other hull builders and other yards and companies completed the boats. The same said for Sweeney. 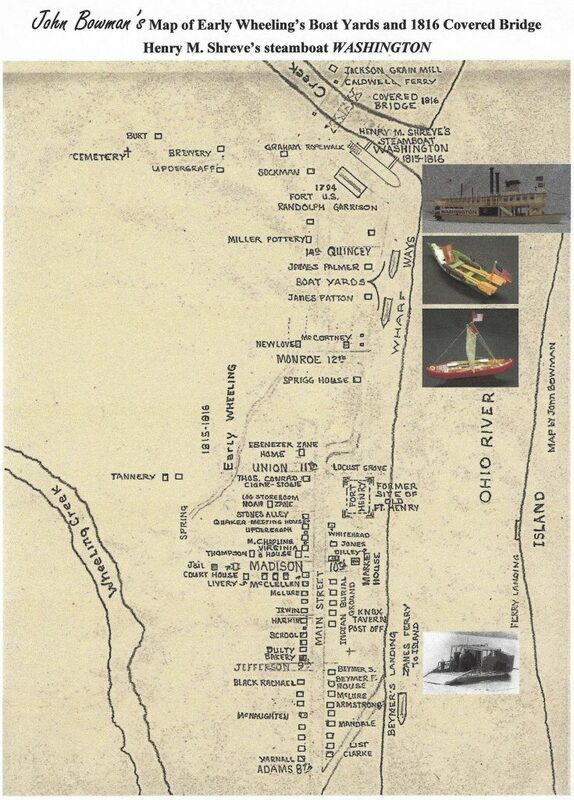 The McNaughton & Dunlevy boat yard at West Wheeling, Ohio is included, as the yard co-owned by Dunlevy and was part of his Wheeling boat building business. 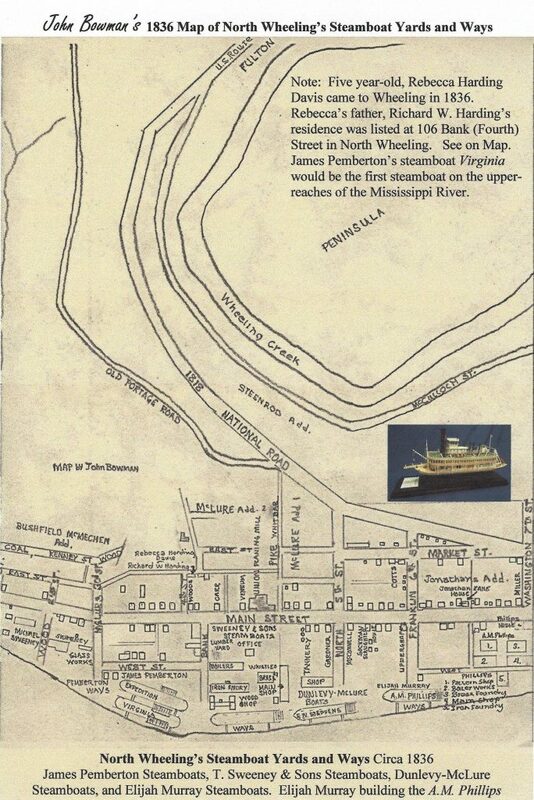 The full documentation (registration) of steamboats built at Wheeling did not start until May 9, 1850. From May 9th through the rest of 1850, thirty-seven steamboats were registered and the register seldom listed the yard or engine builder. I credited boats to the yards that built them, and or to the companies that installed the machinery. The year the boat was built, and the year it was lost or dismantled is noted. Pertinent information is given for each entry when known. Boat names were sometimes changed and the date (year) is noted. Main Sources: Bowman, John, Wheeling The Birthplace of the American Steamboat Wheeling National Heritage Area Corporation, Wheeling, WV, 2008. Way, Frederick, Jr., with Joseph W. Rutter Way’s Steam Towboat Directory, Sons and Daughters of Pioneer Rivermen, Ohio University, Athens, Ohio, 1990. Way, Frederick Jr., Way’s Packet Directory, 1848-1983 Sons and Daughters of Pioneer Rivermen, Ohio University, Athens, Ohio, 1983. Abbreviations Used ST: Stern-wheel propelled boat SW: Side-wheel propelled boat Prop: Propeller driven boat F: Ferry P: Packet boat T: Towboat Rig: Rigged together. Baltimore 1853-59 SW P hull New Martinsville, W. Va. and completed at the Wilson & Dunlevy yard by Hanes & Beam. Machinery by Sweeney ran in the Wheeling & Louisville Union Line. Colorado 1850-53 SW P hull Monongahela, Pa. Finish Carpentry by the James Pemberton Steamboat Yard with machinery by H.W. Phillip. Confidence 1845-49 SW P hull built by McNaughton & Dunlevy at West Wheeling and completed at Wheeling by Dunlevy-McLure. Dr. Franklin No. 2 1848-53 SW P hull by McNaughton & Dunlevy at West Wheeling and completed at Wheeling by Dunlevy for Capt. John McLure, Jr.
Ella 1867-1884 ST Ferry built by Wilson, Dunlevy & Wheeler at Wheeling Sweeney machinery. Ella operated between Wheeling and West Wheeling. Expedition 1818-(?) P built by James Pemberton contracted to U.S. Govt. in 1818 with machinery by Phillips of Steubenville. Express No. 2 1870-79 SW P hull by Wilson, Dunlevy & Wheeler and completed by Sweeney for Capt. Phil Anshutz, with E.J. Anshutz as clerk bought by Capt. A.B. Booth in 1876. The hull in 1879 became the “Booth Battelle & Company” wharf boat. Jefferson 1849-56 ST P built at Wheeling. Kanawha 1864-70 ST T built at Wheeling by Wilson, Dunlevy & Wheeler Co.
Minnie Bay 1883-89 SWP hull built at Belle Vernon, Pa. and completed at the Wheeling yard by Sweeney. John M. Sweeney purchased the Belle Vernon yard from William McFall. Monitor 1876-85 ST T built in Wheeling by Sweeney, and owned by the Monitor Towboat and Lumber Co., John A. Armstrong, offices at Tenth and Market Street in Wheeling. They owned the Nail City and the Ed. Hobbs towboats. Engines were Hobbs, Taylor & Co.
Sallie V. 1867-72 SW P hull built at Wheeling by Wilson, Dunlevy & Wheeler and completed at St. Marys, W. Va.
William H. Harrison 1862-85 ST T built at Wheeling as a ‘transfer’ boat. This was the first boat used to transfer B. & O. Passengers and Freight from Wheeling to Bellaire. Later owned by the Armstrongs. Machinery was by the Sweeney Co.
William Penn 1847-54 SW P built by McNaughton & Dunlevy at West Wheeling and supplied with machinery by Phillips. Thank you, and I use SiteGround.